The Dragon spacecraft is mounted on a fixture in the hangar at Cape Canaveral in Florida. A privateunmanned spacecraft designed to ferry supplies to the International SpaceStation is slated to launch on its first demonstration flight, tentativelyscheduled for early November. 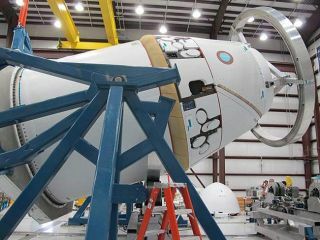 The Dragon space capsule is built by Space ExplorationTechnologies (SpaceX), the Hawthorne, Calif.-based private spaceflight company. The flight,a test of the company's Falcon 9 rocket and Dragon capsule, is being developedunder NASA's Commercial Orbital Transportation Services (COTS) program, aimedat advancing space transportation capabilitiesamong U.S. commercial firms. The firstCOTS demo requires SpaceX to show that Dragon can complete as many as fourorbits around Earth, transmit telemetry data, receive commands, maneuver, reenterthe atmosphere and make a safe water landing and recovery. "Forthis first demo flight, Dragon will make multiple orbits of the Earth as wetest all of its systems, and will then fire its thrusters to begin reentry,returning to Earth for a Pacific Ocean splashdown off the coast of SouthernCalifornia," SpaceX CEO Elon Musk wrote in an online update. "Theentire mission should last around four hours." Thedemonstration flight was previously postponed from a planned Oct. 23 launch. Once SpaceXdisplays the ability to control Dragon's reentry during a water landing, thecompany plans to add deployable landing gear to the craft and use thrusters tobring Dragon down on land. SpaceX launched its first Falcon 9 rocket in June from Cape Canaveral AirForce Station in Florida in a successful test flight of the two-stage booster. Falcon9 reached Earth orbit, about 155 miles (250 km) up. Thespacecraft will initially be used to transport cargo to the International SpaceStation, under a $1.6 billion contract with NASA, with flights slated to beginin 2011. Thegumdrop-shaped space capsule is designed to haul up to 13,228 pounds (6,000 kg)of cargo to low-Earth orbit and return about 6,614 pounds (3,000 kg) to Earth. The shipwill fly near the International Space Station and be grappled and attached tothe outpost using the station's robotic arm. Plans for acrew-carrying Dragon spacecraft are also under development; that version of thevehicle could carry up to seven astronauts. NASA plansto rely on American-built commercial spacecraft, when they become available, toferry supplies and astronauts into low-Earth orbit after its space shuttlefleet retires next year.